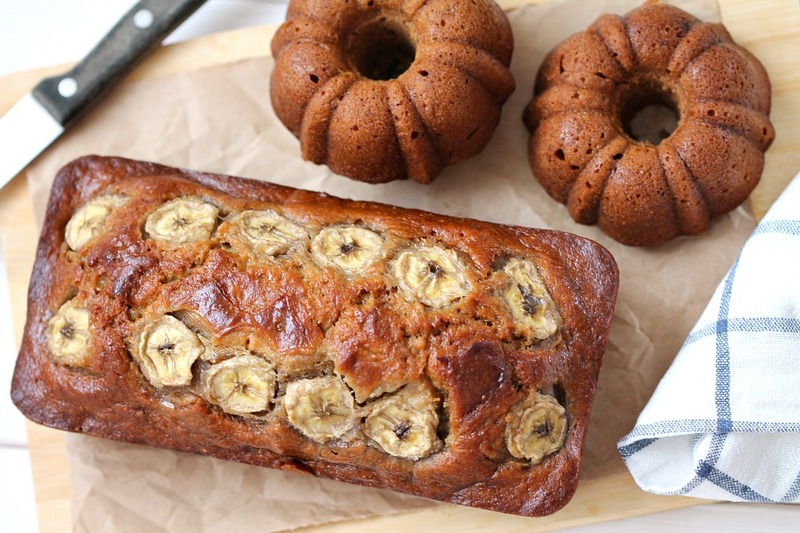 my bare cupboard: Caramelized banana bread with browned butter glaze "
Whenever I buy bananas , there are always some pieces left lurking on the table after few days and since nobody will touch it but me , either freeze the pathetic-looking pieces for smoothie or use them for baking . I already found my ideal banana bread , I like it cakey and sort of spongy , the Flour's Bakery recipe is the one I've been looking for a long time and I baked it 3 times last month alone . Because I can only eat so much banana bread using the same recipe I decided to try another one . I've seen this recipe from the Cooking Light magazine that I've borrowed few months ago and the caramelized bananas sounds very tempting . The recipe is pretty straight-forward , caramelizing the bananas is one easy step to have this very satisfying and moriesh treat . My only problem with the mixture is some small lumpy flour that just wont dissolve , I had to pinch several lumpy pieces before baking tsk tsk ! Note that the banana mixture will still be warm after you finished mixing everything and I think that's normal in this recipe or maybe our kitchen at that time was way too hot ! When making the glaze , make sure to keep an eagle-eye on it , my browned butter glaze nearly turned out black butter glaze ugh ! If your saucepan is not thick enough , use low heat and less time in browning the butter . This bread is very moist even straight from the fridge . 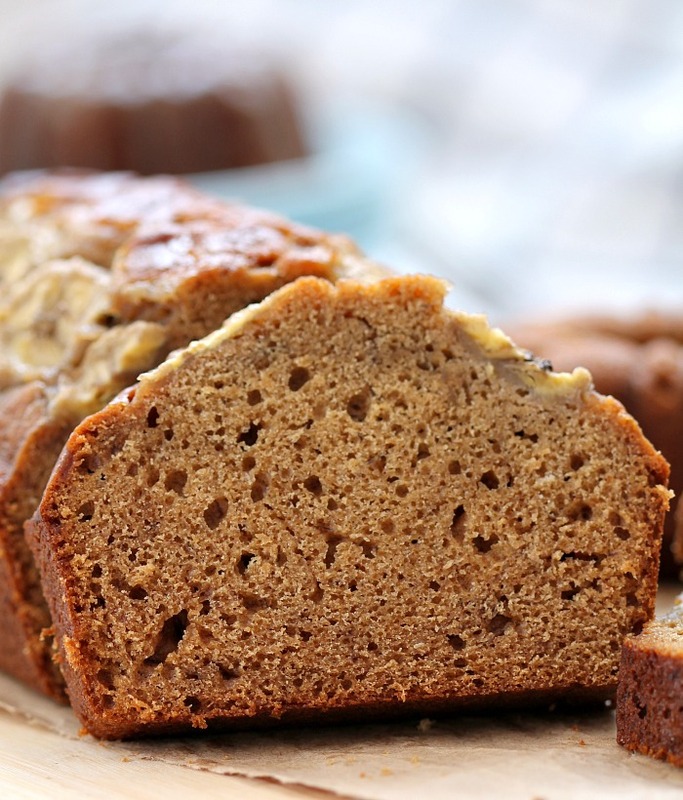 If you don't like cakey and spongy kind of banana bread , you would love this recipe ! * Preheat oven to 180°C / 350°F . 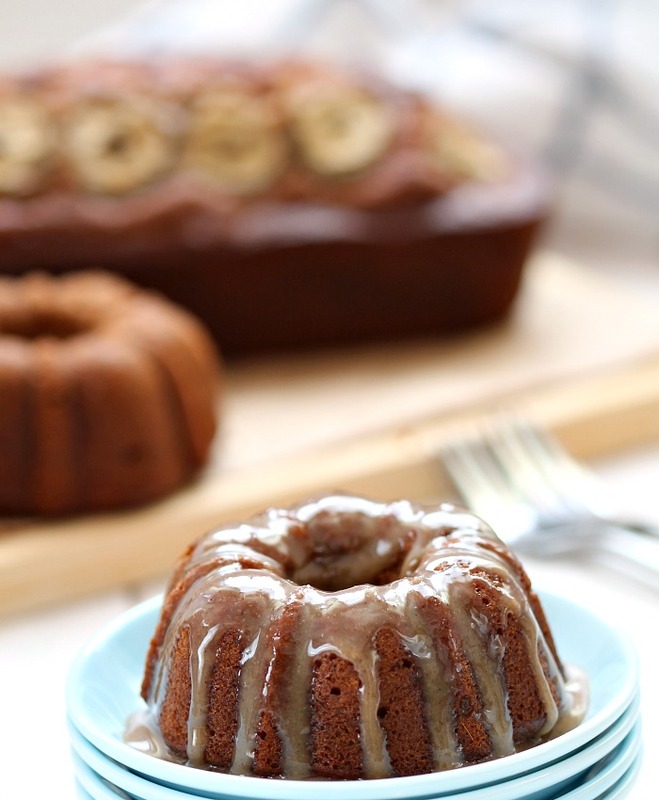 Grease a 9 x 3-inch loaf pan or an 8 x 3-inch loaf pan and 2 mini-bundt pans , set aside . * Melt butter in a large pan over medium-high heat , add brown sugar and bananas . Cook for 4 minutes , stirring occasionally . remove from heat ; let cool for 10 minutes . Place banana mixture into a large bowl and beat at medium speed until smooth . * Combine soured cream and the next 3 ingredients ( through eggs ) . Combine flour , baking soda and salt . Add flour mixture and soured cream mixture alternately to banana mixture , beginning and ending with flour mixture , beat a low speed just until combined . Pour mixture into the prepared pans and top with banana slices . * Bake 35-40 minutes for the mini-bundts and 50 minutes to 1 hour for the loaf pan or until skewer inserted in the middle of the bread comes out with a bit of moist crumbs . Transfer to the wire rack , cool for 10 minutes before removing from the pan ; let cool . * In a small saucepan , cook butter until it starts to turn brown , depending on how thick is the saucepan , it'll take less than a minute so keep an eye on it . take pan off heat , sift in icing sugar and add in the half and half , whisk until mixture is smooth . Drizzle immediately over the cooled bread . let glaze set before slicing the bread . This must be esp. flavourful with caramelized bananas, Anne. Two small ones are so adorable. Anne, I love banana bread. I'm sure the bread tastes more delicious with the caramel. Yummy! whoa…I want that slice please it looks awesome! I like the look of the crumbs, the glaze sounds delicious too! The cake looks moist and delicious. And with the glaze, either black or brown, it does not matter, it looks really good! So far my favourite banana bread is Nigella's, though I have an old favourite that I've baked for many years, and suddenly stopped using that recipe, putting the blame on too many cookbooks and other recipes to try. Got to dig out that old recipe one of these days! Any caramelized fruit sounds tempting to me. I love them in oats porridge and I am sure it tastes wonderful in bread. Looks good!